Splitting Axe - Which Axe Is The Best? A splitting axe is a tool designed to split chunks of firewood into smaller, more manageable pieces. Splitting the wood allows air to reach the wood from all sides, speeding up the drying process. Seasoned wood, which has a moisture content of around 20%, burns hotter and generates more BTU's than green firewood. Burning green firewood uses the fires energy to evaporate the moisture inside the wood, resulting in a hissing and sizzling noise. This noise is the sound of your heat being wasted. Seasoned wood also creates less creosote buildup inside the chimney. Creosote is a flammable residue left over from unburnt gases that adhere to the inside of your chimney. Over time, the creosote could catch fire resulting in a dangerous chimney fire. Anyone who has split wood by hand knows it can be an exhausting experience. To help make the process easier, it's important to choose the right tool for the job. The axe is a common tool found around most homes. Commonly called a felling or cutting axe, the axe is used to chop wood. It has a slim, sharp blade designed to cut crossways through the fibers of the wood. The felling axe has been used for many years to cut wood but since the invention of the chainsaw, going out to cut firewood with an axe is not very common. A felling axe should not be used to split wood. Generally if you try to split a medium sized piece of wood with a felling axe it will just get stuck in the wood and you will be lucky if you can get it out. The felling axe is designed to cut the fibers of the wood not split them apart. If you are going to chop a tree or branches, a felling axe is the proper choice. 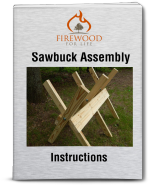 If your looking to split wood, use a tool designed for the job like a splitting axe or a maul. This style of axe can be a great choice for splitting wood. 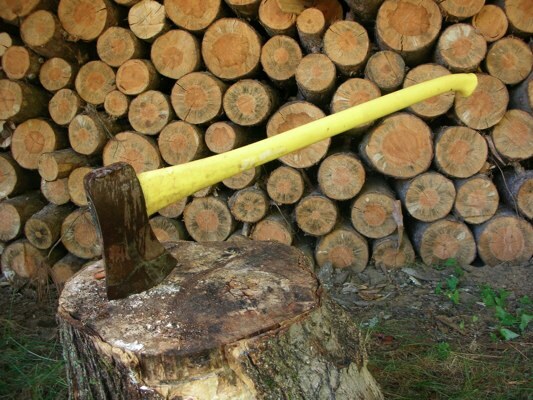 The axe head is designed to split the wood fibers apart, not cut them. They come is a variety of different styles and are made by several different manufactures. 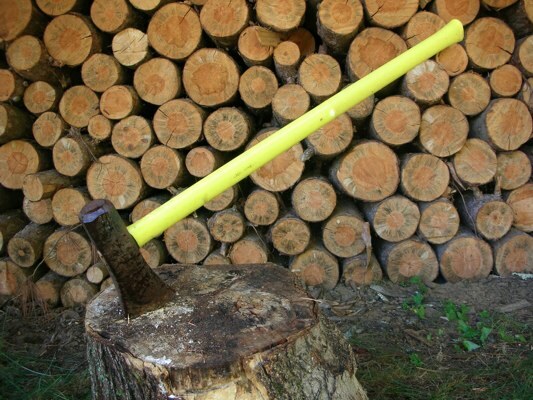 The axes are lighter than a maul and reduce fatigue allowing you to split wood for longer periods of time. You can choose between a fiberglass handle or wood handle. Fiberglass is lighter and more durable than wood, but many people still choose the traditional wood handle. They come in different lengths and you should choose a length that is both comfortable and safe for you to use. Thanks to new technology and designs, this style of axe has become a favorite tool for anyone splitting firewood. 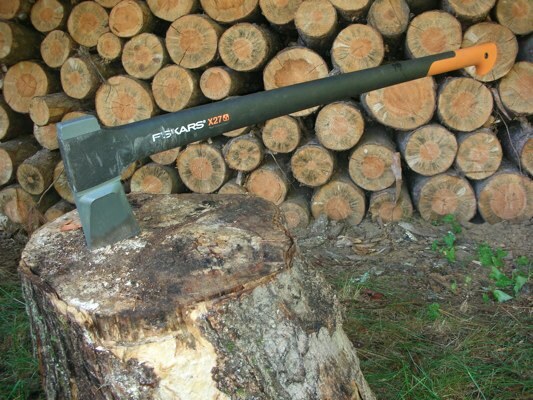 The axe shown in this picture is the Fiskars X27.......a great axe! A maul is a longer handled, heaver tool used the split the wood fibers. They generally weigh between 8 and 12 pounds, requiring more energy to swing them. The edge on the maul is not as sharp as an axe because the blunt edge is used to split the wood fibers apart. The head of the maul is wide and V shaped which also aids in splitting the wood. A maul can be a very useful tool for splitting firewood. The disadvantage of a maul is the weight. Depending on the user, the lighter splitting axe may be a better choice. Ultimately, personal preference will depend on which type you choose to use. I used a maul to split wood for years until I bought a splitting axe. The difference is amazing. The axe so much lighter and it easily splits the wood. A majority of the logs are split with one swing! The weight of the axe is it's greatest asset. The lightweight design allows you to swing the axe for longer periods of time without becoming fatigued. It's important to place the log you want to split on a block. The blade on the splitting axe soft. If you just split the log while it's sitting on the ground, the blade of the axe will go into the dirt and chip the blade. For around $10 you can purchase a sharpener for the blade of the axe. Just a couple passes through the sharpener will create a nice edge.